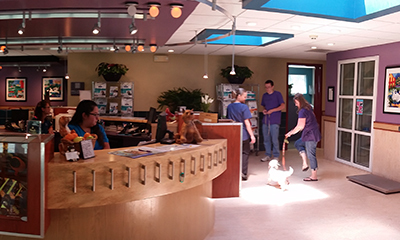 Veterinary Dental Center is a pet dental and oral surgical facility that is designed to provide a relaxed and fear-free experience for pets and their owners. With state-of-the-art technology, equipment, and trained certified staff, we aim to give the best care to these faithful companions. 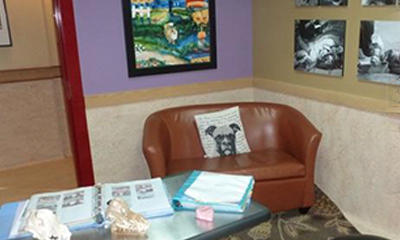 We aim to put you and your pet at ease the moment you walk in. The reception is warm and inviting with ample room for pets and their parents. There is a separate cat waiting area and coffee/snack bar. Dental consultations are performed in a relaxed and informative manner. Many are examined on your lap or hanging out on the carpet, while the “wiggly” will settle on the exam table. We will use models and photographs of similar cases to illustrate the treatment(s) your pet needs. You can choose to “checkin” or observe the procedure. The dental suite is State-of-the-Art with dental specific lighting, anesthesia, patient monitors, dental x-ray and specialized instrumentation to allow routine to advanced dental and oral surgical care. 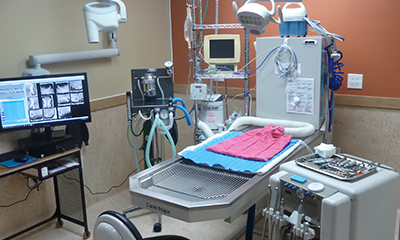 Three fully equipped dental workstations that include: dental lighting, gas anesthesia, multi- parameter anesthetic monitor, I-pad charting system, IV fluid pump, patient warming, digital dental Xray, and complete dental and oral surgery instrumentation. 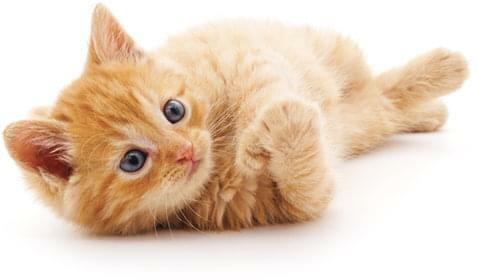 The comfort and safety of your pet are of utmost importance to us. 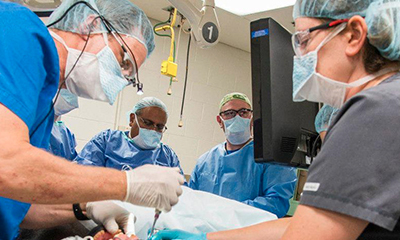 A veterinary nurse is assigned to each patient to monitor anesthesia and be present throughout recovery. 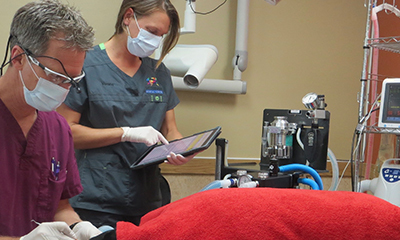 We have leveraged technology to use I-pads for anesthetic monitoring, medication calculations and data is transferred to your pet’s medical record. 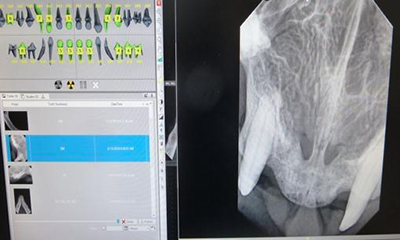 Unlike standard X-rays, digital dental X-rays provide higher detail images, magnification and changes in contrast as well as reduce radiation exposure to our patients. Learn more. 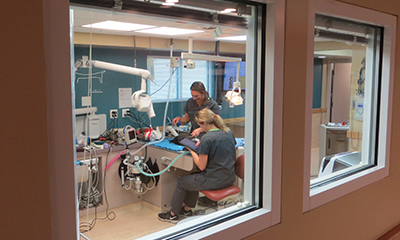 We are fortunate to donate advanced dental and oral surgical services to Brookfield Zoo. The picture illustrates a collaborative procedure we performed with a Orthopedic surgeon. We performed oral surgery and extractions on a “senior” Gorilla while surgeons performed arthroscopic knee surgery to minimize anesthetic time. We provide care for a large number of working dogs (Police, Herding and Sporting). 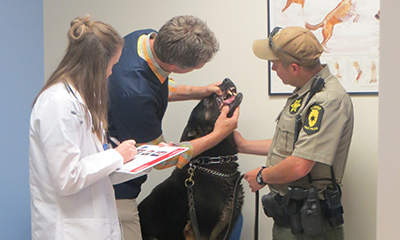 Tooth trauma or fracture is common in these dogs and they receive root canal therapy and metal crowns to protect these functionally important teeth.